Hockey is a team sport played on ice, in which skaters use sticks to direct a puck into the opposing team's goal. It is a fast-paced physical sport. Ice hockey is most popular in areas that are sufficiently cold for natural reliable seasonal ice cover, such as Canada, the Czech Republic, Latvia, the Nordic countries (especially Finland and Sweden), United States, Russia, Slovakia, Germany, Austria, and Switzerland. With the advent of indoor artificial ice rinks on plastic tile like sport court it has become a year-round pastime for many kids. - WikiPedia Thanks! 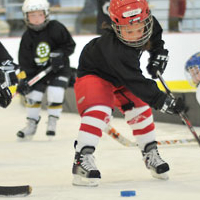 At HockeyPants.com we feel that participating in sports like ice hockey can help a child become more confident in his or hers skills. As children practice and work to become better at any activity, their confidence level will increase. This new-found confidence will carry over into other things besides sports, including their studies and personal lives. We can provide you with a large selection of youth hockey pants, youth ice hockey pants and youth hockey pants equipment for great discounted prices at HockeyPants.com.